The front line professional and support staff have a lot to contribute but aren’t always in sync with the viewpoint of their employers. The relationships they have back in the workplace could be adversely affected by saying the wrong thing. We do from time to time make submissions to the LHINs. The reception has been fair, but a lot of consideration goes not only into making our case, but also in how to protect our membership from reprisal while doing so. Sometimes the knowledge they hold is not widely disseminated and all paths can lead back to an individual even with the union serving as the shield. Sometimes we have to exclude critical information from a submission for that reason. For some employers this is not a major issue. They encourage open dialogue and consider it part of the push and pull of being in the public sector. Often this results in a much better relationship between unionized staff and management. Others are far less understanding and see any contrary viewpoint as a challenge to their authority. It’s usually at these workplaces where participatory continuous improvement programs like LEAN end up falling apart in an undercurrent of cynicism. LHINs do have professional advisory committees – though many front-line workers would see the individuals on these bodies as distant from their day-to-day concerns. They certainly aren’t local. We also wonder, as funding increasingly follows the patient, whether speaking openly will become even more of a challenge as hospitals start looking at marketing themselves to attract patients and funding. As the Standing Committee on Social Policy engages this winter in its review of the LHINs, perhaps whistleblower protection should be given some consideration. Surely something is missing when the workers who have face-to-face interaction with patients feel they cannot safely engage in community health care planning. Without labour participation, the sub-regional labour committees in the Central East LHIN never happened. That’s not only the LHIN’s loss, but ours too. This entry was posted in Uncategorized and tagged labour participation, LHINs, Whistleblower protection. Bookmark the permalink. You shouldn’t feel too lonely. Publishers don’t get invited either. OPSEU members are invited to write for our publications. Material is subject to editorial review by editors who appreciate material that is original, meaningful and well written. Contact thepublisher@longwoods.com or editors@longwoods.com. Maybe you should consider attracting retired members of OPSEU who would not be vulnerable to an employer. Fair comment on the dynamics of LHINs and org. as you say, they vary in approach. Starting off with whistle blower as entry point, seems to set up too conflictual and fearful right off the bat. Whistle Blowing is a whole other creature of activity and unlike to be first way to rally front line workers to dialogue at different levels of the care system. While “radicals” term a little silly, the UK , National Health Service is doing some interesting things.. check out the link putting emphasis on the front line as a critical component of system change. Check out the short and kind of fun video, that gives a bit of energy. “The School for Health and Care Radicals is a free, online ‘school’ to support people who want to be a ‘change agent’ within their organisations and communities. Established to support NHS Change Day, members will be provided with powerful ideas, tools and connections to survive and thrive as a change agent. Starting on 31 January, there will be a weekly web seminar each Friday morning from 9:30am to 11am. Thanks for finally talking about >Want direct front line input into health planning? How about whistleblower protection? 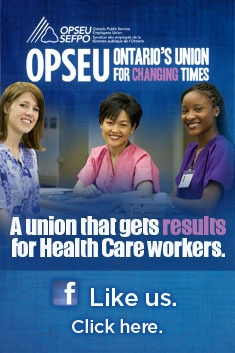 | OPSEU Diablogue <Liked it!